Viewing topic "Chick’s Marks V / Noise tail"
What is a “noise flag”? Which Voice do you detect this “noise flag” on? The German word “Rauschfahne” translates in English to “noise tail” or “noise burst”. I’ll look into your observation and see what I find. I’ve loaded the Chick’s Mark V library to my XF. I notice no problem with the first User Voice, even with the volume level turned up to listen to sustained note tails. Which OS version is installed on your MOXF? I checked now again every thing and realized that the noise tail is coming from the sample it self. Enclosed you will find the recording of the preset no 1 with noise tail. 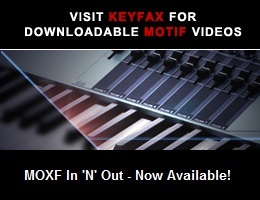 Question: Is there maybe a different in the hardware between the MOXF and the XF, because you don’t hear the noise ? Do you mean the notes playing at around 40 seconds into your audio clip? or is this thread about hiss, hum or cracks and pops? The samples are from the Rhodes Mark V owned by Chick Corea. Whatever characteristics/idiosyncrasies it may have were captured in the samples. I’m not hearing anything unusual from the MP3 you posted. OK. I asked because an early version of the OS had problems with certain samples loaded to the flash module, and produced artifacts. V 1.12 doesn’t have such a problem. There are some hardware differences between the two models, but they shouldn’t matter in this case. More to the point, your MP3 sounds similar to my XF. If any members find that the posted MP3 has noise that your own MOXF doesn’t, when playing the Chick’s Mark V Voice, or you hear something not expected from a Rhodes, please let us know. I’ll go with the hiss. At first I thought it might be the inharmonic partials beating at the end of the passage, then I listened closely to the hiss. From 0:18 on it appears to decay in a cyclical pattern nearly every 2 seconds as the EP can still be heard faintly decaying. Most pronounced from 0:24 to 0:32. I was comparing this with many other EPs on the MOXF, but this phenomenon I can only hear in the Chick’s Mark V presets...! The good thing: You can not hear it in the mix with many instruments, but you can hear it if you play solo with long sustain tones. Maybe its a characerstic of the Mark V, but for me it is not clean like all other EPs in the MOXF ! I can certainly hear some noise, but it seems to me that it would be an issue only under very revealing circumstances. From about 18 seconds onward, the level is below -50dB. From about 22 seconds onward, the level is below -55dB. From about 26 seconds onward, the level is below -60dB. From about 30 seconds onward, the level is below -65dB. Some of that is the decaying sound envelope, some is noise. I’ve heard worse. The PDF manual that comes with the distribution explains that the particular Mark V is not generic, but one specially modified for Chick Corea. It was sampled at a studio, and the samples later processed by Yamaha. Who knows what the noise can be attributed to. I’m not defending the quality of this library. If anyone finds the noise objectionable, I suggest either editing the Voices or not using them. I personally don’t find the Chick’s library worth devoting nearly half a gig of flash memory to. It is good that some noise in the Chick Corea library is now confirmed, even the problem is not realy solved now. I realised that the noise are less in the MP3 File than I hear normally trough my headphone (using the headphone jack on the keyboard). The reason for it is maybe that the audio routing for recording of this MP3 file was trough USB Connection to the Computer with a DAW Software. Here’s a few things to think about (not in any particular order). Noise, like the noise you have noticed, is common and often much more noticeable in many other sample libraries across the full spectrum of sample formats out there. It is also commonly found in samples of vintage gear, and it is sometimes very hard to sample the most intricate qualities of an instrument and set up a multi sample library without recording it, and without multiplying it. Remember that a multi sampled instrument library with only 5 note samples (for example) at one velocity, is 5 recordings of the same instrument when played all at once. They’re all recorded from the instrument’s main output each time, so that’s 5 lots of simultaneous system noise when you play them all together. Let’s say you start playing big sustained and extended chords on a much more deeply sampled library, you could be hearing maybe 20 audio recordings at once. Chick’s Mark V isn’t to my personal taste, but if you’re going to use it in your music, you already said a very sensible thing, which is that these noise problems could be masked out when in a mix with other instruments. Failing that, if the problem occurs in an exposed part of your music, you could try an EQ with a very narrow Q on the right frequency, at the right time. Any good DAW will allow you to do that using automation. An MP3, depending on the quality of encoding, can often have a positive effect on the reduction of system noise, but you’ll usually find that it has had a negative effect on the overall sound of the recording if the former is true.